Prices will vary, depending on when you book. But you will always obtain 10% discount on the current price shown on-line. IMPORTANT NOTE: In case of experiencing any problems when booking your accommodation using the above system, please contact Hotel Balmes/Hotel Astoria or Hotel Granados. 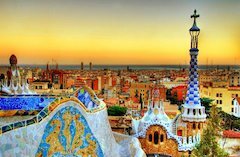 The seminar dinner on Friday 07 November is also organised in a hotel of the Derby Group: Hotel Claris, a beautiful 5 star hotel near Passeig de Gracia! We hope you can join this dinner. Make sure you book it when registering for the seminar.